Hi. I have been looking through the forums and the source code to learn more about each of these but I'm not sure which one to use: intentions, live templates, or actions. Honestly, I'm not even sure what the proper definitions are. When I am writing Java code, I use the meta-J pop up all the time to generate iterations and so on. It's incredibly great! I also use the generate ctor, toString(), etc. stuff. I also sometimes used the tiny little pop-up/hint thing that suggests I can replace an if-return with a simple return expression etc... I think the itar is called a live template and the pop-up hint thing is an intention. How is that different than an action I created my plug-in with "New Action"? 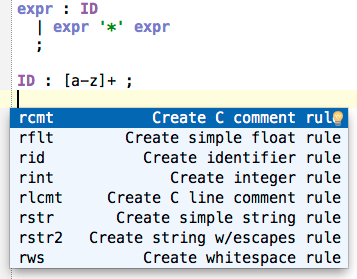 My goal is simple to start with: for the ANTLR plug-in, I would like to allow programmers to insert predefined rules for common lexical items like identifiers, comments, white space and so on. I envision providing multiple versions of floating-point numbers and identifiers but in general there will the perhaps less than 10 kinds of text blobs I want to inject. In the future there might be more. I would like the user to be able to specify the actual name of the rule as part of the injection just like I specify the iteration variables with itar template. In the future I might also want to select a string reference like 'begin' in the grammar and have it automatically generate an associated lexical rule like BEGIN : 'begin' or something like that. I'm not sure whether that would be done with the same mechanism/concept. My question: should I be trying to build a live template set? an intention? a set of actions? Are they all really the same thing just invoked in different ways? Sorry if this is obvious. I just want to make sure I don't go down the wrong path only to find out I'm using the wrong mechanism. I can figure out the API for myself from the examples and code if I could just get the proper starting point. Live templates are code snippets, possibly with some placeholders, inserted into editor using Meta+J or (since IDEA 13.1) just code completion. They are invoked by entering their prefix. 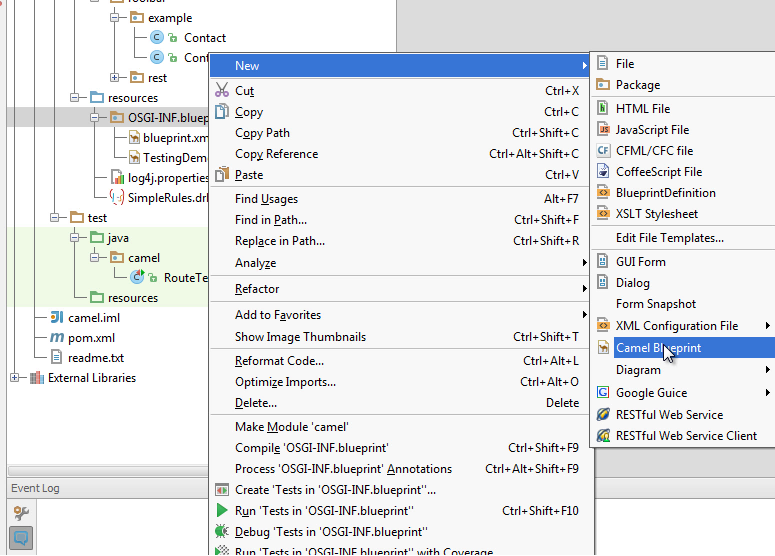 Intentions are actions that can be invoked from editor by pressing Alt+Enter when a light bulb appears, indicating that the IDE can do something automatically for you at this position. Common cases are simple code transformations (De Morgan laws, condition invesion etc). Actions are... well, actions. Things that can be invoked, most often from a menu or a toolbar. Or via a shortcut. They all can be found in Meta+Shift+A (Go To Action). When you generate a constructor, you're using Generate action (probably invoked with a shortcut). In fact it's an ActionGroup (composite action) containing other actions: for constructor, getters/setters, equals/hashCode. A plugin can also contribute its own actions to that list. Peter gave a really great answer, one additional API I can mention is the file template extension points. Thanks so much guys! woot! I'll add to my plugin dev notes and consider your suggestions. Check this out. :) From your help and reading the intellij source code, it was clear how to get this working.